In a presentation at the Printed Electronics USA 2013 Conference in California, local startup Kateeva has shown off a new method of producing OLED screens that it claims will last twice as long as current models and be much cheaper to manufacture in bulk. OLED display manufacturing is a very tricky process using today's techniques. The screens are produced in a near vacuum to induce thermal evaporation and stop impurities damaging the light-emitting diodes, then the substrate is masked and the screen's surface is applied. But error rates are still high and the complicated process makes OLED's phenomenally expensive: LG wants $13,500 for its 55-inch telly, and that's a tough sell for most pockets. Kateeva has spent the last five years (and a fair amount of venture capitalist cash) trying a different route. Its CTO is Steven Van Slyke, who with his Kodak boss Dr Ching Tang invented the first basic OLED screen, thinks the company has cracked a different manufacturing method using inkjet printers to lay out new OLEDs. Inkjet printing of OLED screens isn’t new – Epson's been working on it for years - but no-one's using it in volume. Kateeva's system, dubbed YIELDjet, uses a combination of highly focused ink nozzles, purpose-built inks, and a totally sealed nitrogen manufacturing chamber to slash the costs of production and increase the lifespan of the finished screen. The nitrogen chamber is completely enclosed during manufacturing and has less than one part per million of oxygen or water contamination. The company says it has borrowed from the semiconductor industry to cut the amount of contaminants tenfold on alternative manufacturing techniques. This doubles the lifespan of the screens, it claims, and slashes production costs. 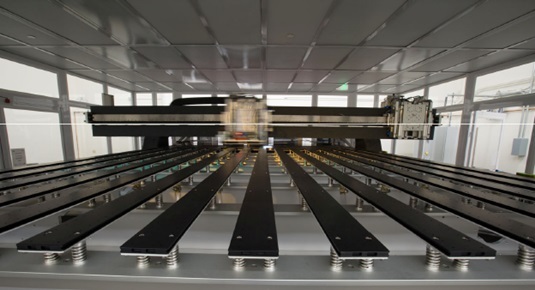 The company develops its own OLED inks and the print head lays down the screen's components using precisely engineered nozzles, controlled by software that ensures a smooth deposit. Kateeva has five prototype systems in operation, producing screens up to 15-inches wide, and is building a larger unit capable of building 55-inch screens. "YIELDjet was inspired by a simple vision: help display manufacturers realize the full potential of OLED technology so that their customers can enjoy and benefit from these dazzling new displays," said co-founder Dr Conor Madigan, in an announced.